This year has been and continues to be a very busy year in the construction industry, and while that is a terrific situation for many, it can be a tough situation for those who need or want to expand, remodel, or move ahead with their new construction project in a hurry. We find sometimes clients who haven’t had a commercial construction project in their past might not understand the pre-construction timeline and all the work that has to be completed before any ground is broken or active construction begins. 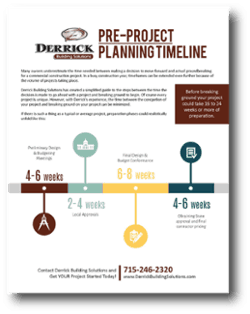 We have put together this quick and easy guide about the typical pre-construction stages a project goes through from permitting and design to budgeting and approvals. This can help develop workable timeframes and realistic expectations for all parties involved. If you ever have questions please feel welcome to contact our office and one of our professionals will get back to you ASAP. Expand, Renovate, or Build a New Building? Sign up to receive our free monthly e-Newsletter to get the latest design + build information delivered right to your inbox.